Singing Celebrations: A Master Recipe! Giving real value to singing started during the time when I was working on my album ‘Soulweaver’, for Malimba Records, two years ago. Much of my recording work is a long and solitary journey as I play most of the instruments by myself (cello, dilruba, guitar, bass, flute, plus many others) and I compose through the use of improvisation. Listening carefully to what I play spontaneously, I then slowly crystallize the melody lines. While I was recording Soulweaver, from time to time I would pick up my guitar and just sing for a while, as a contrast to the concentration required for my recording work. Singing would relax and refresh my listening sensitivity, and help me to dive back into the recording process. Then, unexpectedly, a friend of mine one day invited me to guide a singing evening with a group of friends. That evening turned out to be a milestone for me. I realized how easy it is to create a heartful synchronicity and peaceful atmosphere through singing; how easy it is to reach out and unite through the act of singing together. The guitar is a wonderful instrument in this context. The guitar offers rhythm and harmonies at the same time, which makes it very easy and inspiring to sing with. My cello or flutes don’t make these qualities so easily available. So I decided to offer Singing Celebrations in my studio, and over the past two years these events have become very popular. For my Saturday night events, thirty-five to fifty people usually come to my place in the countryside, many driving up from Montreal. The people who join the celebrations come from many different circles. I love to see children, young adults, people of my age and older, all meeting together. It simply means that age does not matter here. The beauty of singing and listening together is that an atmosphere of intimacy and joyful vibration is easily created without the need to know each other personally. Singing together for a couple of hours certainly takes you deeper than hours of social chit chatting will ever do. 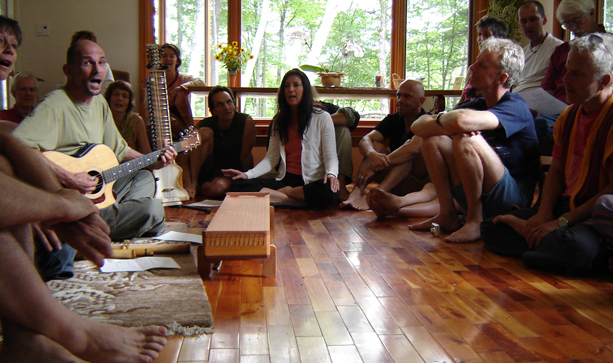 I now also offer monthly Singing Celebrations in yoga centers downtown in Montreal, and weekly “Enchanting Evenings.” Sometimes musician friends join me for these events. So how does it work? I use songs from many sources: mantras and kirtan chants, Native American, gospel, Sufi, African, French, English, Portuguese, and my own compositions. I love to explore the sonorities and acoustic feel of different languages in a song. My list of songs expands every week! Any song or chant that makes me vibrate and is easy to teach is good. With a new song, I first need to get high or silent through it while alone, and then the song has the potential to be brought into a larger circle. The spark can then easily jump from me to the group. I put a lot of emphasis on listening. In fact, to me, listening is the most important factor; the factor on which everything else depends. Listening also means sensitivity and receptivity – and when that musical sensitivity is there, whatsoever happens turns out right. The Singing Celebrations can be very dynamic and at the same time very gentle. It all depends on the depth of sensitivity. The strength that comes out of sensitivity has a very different flavor than a power that is imposed. And the voice is such a wonderful mirror; it easily reflects this principal. Sometimes we sing loudly without being connected to our sensitivity. That’s when the voice has a flatness to it – high volume, but no depth. And that’s when it is time to bring the volume of the voice lower. Have you ever observed how much force there is in whispering? Immediately your listening and presence expands to catch what is said. Try it out! All of this happens very naturally during the singing events. I love to play with the dynamics of a chant or song; it brings so much aliveness into it. To me, listening is also the key to bringing out one’s own voice. Often people tell me that they can’t sing. That is not a problem. I simply encourage them to start listening – the voice will follow in its own time. I myself haven’t got an outstanding voice; I simply consider it another instrument and I’ve learned to do a lot with it. The same is the case with singing in tune. Once you start listening to your own voice and the ensemble of all the other voices, it is very difficult to stay in disharmony. The voice has a natural tendency to harmonize. And you don’t even need to understand what is going on – it all happens naturally. It’s magic! Some people take a while to become aware of their own beautiful voice. A few times, I’ve heard a wonderful voice suddenly awaken, and the person has looked at me in disbelief when I’ve pointed it out. It is hilarious when this happens. Some of the most delicious moments are the silences that follow the chants. We all fall into meditation, and it is so easy. I rarely talk about meditation or spirituality. At the most, I mention how nice it is to hang out together in silence, without having to do anything. To me, music and singing are simply the most wonderful excuses to share this unlimited space and depth that we all carry within. And music can invite this treasure in such a gentle way. These days, here in Quebec, it has become almost a tradition amongst the circles of my friends that we sing or play some music, followed by silence, before any celebration. It breathes a wonderful smoothness into the mood of the whole evening. It is a master recipe! Editors note: ‘Soulweaver’ recently won two awards from the Coalition of Visionary Resources (www.covr.net): “Best CD of the Year 2006” and “Best Speciality Music.” Congratulation, Kalyan!